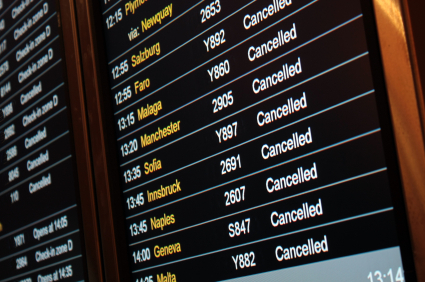 Are you covered for holiday season delays and cancellations? The holiday season is in full swing and millions of Brits are heading off somewhere hot abroad, or even to a rainy campsite in the Lake District! But if the journey to your destination is affected by something unforeseen, such as the recent strikes in Calais, and you experience cancellations and delays, what are your compensation options and will you be able to claim on your travel insurance? Compensation for train delays of more than 30 minutes can be reclaimed within 28 days of travel. Make sure you keep your ticket. If the train was cancelled altogether you can claim the full amount back, if no alternative transportation to your destination was offered as a replacement at the time. Severe weather and other circumstances beyond the train companies’ control which cause problems can’t be claimed for. Relatively new EU regulations mean that you can now claim compensation of up to 250 euros if your flight is delayed by more than three hours and the airline is based in an EU member state. Compensation is available of up to 600 euros for the longest flights. The flight company must offer either a free new flight ticket or a full refund of the cancelled flight. It must also cover the cost of hotels and subsistence until the replacement flight leaves. However, don’t be able to claim for living it up in five star hotels! As with train travel, the rules exclude events outside an airline’s control. So airline’s didn’t have to offer compensation for the recent strike action seen in France which lead to huge delays; however, most at least offered an alternative flight or full refunds. Make sure you keep all receipts, tickets and proof of purchase. If you miss the departure, for whatever reason, the airline, train or bus company won’t compensate you. However, if you have insurance you should be covered (see below). Make sure you contact whichever company you were travelling with as the return portion of your trip might be cancelled if you don’t make the outward leg but still make it to your destination. If the delay or cancellation is the fault of the company responsible for the transportation, then higher quality travel policies may pay for additional accommodation and travel costs. But others will only probably stretch to a few meals if a delay is over 12 hours. If this is something you want to ensure is part of the policy you take out, you’ll have to double check with the insurer and, it goes without saying, read the small print. If you miss your departure through your own fault, such as getting the flight time wrong, then you won’t be able to claim extra costs incurred back from your insurer. However, if not, and you didn’t make the train, plane or bus due to circumstances beyond your control then most insurance policies will pay for the onward travel needed. Again, make sure you keep a record of all additional expenditure.